The fake death, the simulated corpse, the staging of human remains evokes more of the human end than the real thing. 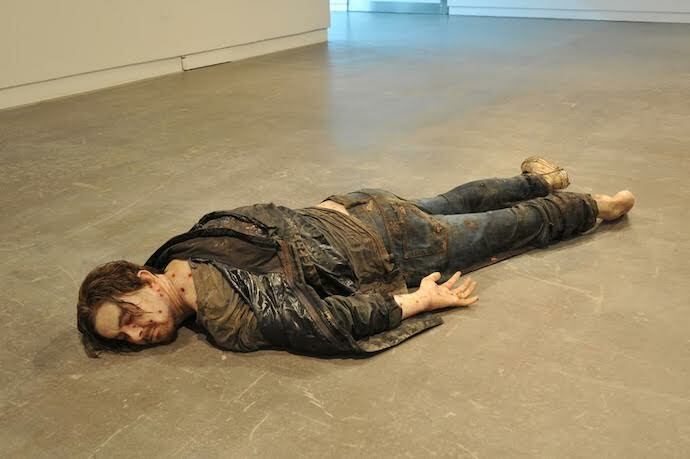 Jeremy Millar’s Self Portrait of a Drowned Man represents Millar’s own fictionalized death by drowning, its depicted removal thereby becoming a spectacle of its own disingenuousness, his absence an intentioned presence (both as object and creator); and yet its conflation of hyperrealism and obvious fakery is more a manifestation of what isn’t, and wasn’t, than that managed by any real drowned man. With both, I imagine lives that might have led to this: with the sculpture I know I’m playing along with an object, giving it its due, paying it the courtesy of engaging in the way that is asked of me, and in this respect I do nothing different with the actual corpse, as I engage my empathetic strategies in order that the object in front of me can justify itself. But where they differ is in the threat that is posed, because it is only the ersatz death that has already happened to me, is at this and that time happening, is constant and irremovable, whereas the real death is always elsewhere, realized in someone other than me. I can pass the latter death off in opposition to my present state, and like this reaffirm life and death as not so much diachronic as synchronic. In other words, my conscious existence embraces the simulated and rejects the real. The reality of the dead man on the quayside is therefore made less real in virtue of its representing a reality to which I have no access, and it is for this reason that while the staged corpse is more of a threat, the real corpse is more viscerally impactful—at least for those of us not in the habit of seeing them. The loss of this impact in those who have for whatever reason become desensitized to seeing dead human beings, those for whom “the human body [exists] as an object, an anonymous thing belonging to no one, which one could dispose of in an arbitrary manner,” an aggregation of “indifferent brute matter” [i] even, allows them to acknowledge the real corpse’s threat and so defend against it, as if it were its faked counterpart. The systematic dehumanization of our dead (which is often in evidence long before death has occurred) is a protective device, a simulation of anonymous substances, of the antihuman as proof of the human, but ultimately a line of defence that instantiates the very thing it must defend against. The impact, then, of seeing what was once alive and human is the very thing that distances you from it; and if we attempt to reduce this impact—by removing all past similarities—we thereby increase our contiguity with death, for the very act of extracting the threat, of a presentful non-presence that must be extricated from what it means to be human, itself enacts an inhuman death, a copy of death, a death less event than it is thing. “Simulation is infinitely more dangerous because it always leaves open to supposition that, above and beyond its object, [… life and death] themselves might be nothing but simulation.” [ii] I contradict the real human corpse and become more recognizably human through the contradictory state of the corpse’s humanness and lack of humanness. But as soon as that impactful contradiction is removed, the representation of the dead human body maintains a proximity to my conscious states through its never having been human, while at the same time mimicking convincingly what it is to be a dead one. The “useless violence” [iii] of treating human corpses as raw materials for the manufacture of insulation, swamp fill, and gravel, differs from the useless violence (this very uselessness an oft-used and apt definition of art itself) of the faked human cadaver, in that respectively the one performs irreverence and the other reverence. And though it might seem counterintuitive, it is this reverence that poses a threat to us. [iv] For the difference between the real and the simulation has been canceled out, shown not to exist, in one very important way, in a way that permits the signposted unreality to cause harm (and by harm I mean a beneficial, honest harm, harm done to a deserving recipient of it: the exorcising of self from other and, following that, from itself). I am talking here of a reverence that is felt unjustifiably: an emotive response that is undermined by its own attendant principles of appropriate application. To abuse the dead is to still acknowledge the threat of the dead, as if death had not removed everything, as if death had only compounded what it was about the living body that had made death necessary. This irreverence, then, is always a failure, is always a symbolic gesture of a powerlessness to remove, or to remake, or to control. Death is found not to have done the work demanded of it, because it does not and cannot redeem its cause. Irreverence post-death is the plainest statement to the fact that death is not enough, that death always leaves behind incompleteness. Irreverence here then translates as reverence for the irreversibility of life, for some life having existed at all, and the impossibility of ever removing its history. 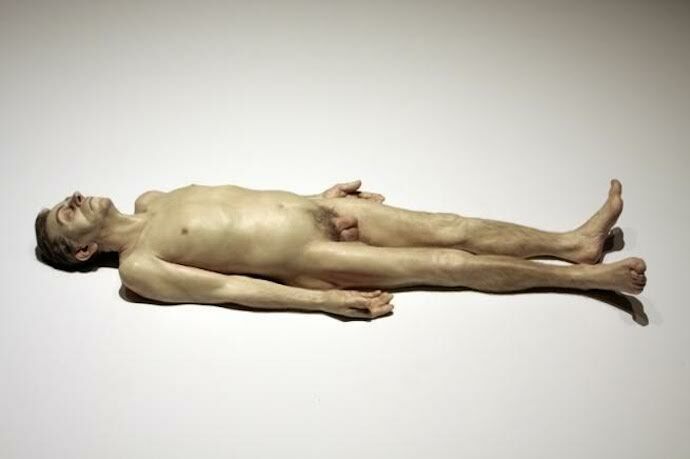 The referent in the case of Self Portrait of a Drowned Man is a living man, an artist imagining his death by drowning as the most accurate portrayal of his being alive, but with Ron Mueck’s Dead Dad, there is a real death referenced, Mueck’s own father. The pale, obsessively detailed and scaled down body lies on its back, elevated off the floor only by the thickness of a white marble slab, and we look down, crouch to see the lines and the crinkles, the insane meticulousness of death as diminishment, as if we were so remote, giants in this life of ours. The realism here, as with Self Portrait of a Drowned Man, is the simulation of death via a real death, but a real death that does not recognize itself. However, the alteration in scale makes this lack of recognition explicit, so that our relative enormity comes to feel not like power or overcoming or imperviousness, but a fundamental untruth, a disclosing of an immaterial distance, inside which life is grasped only in terms of the pervasiveness of its removal—which is itself only the removal of an hallucinated distance. 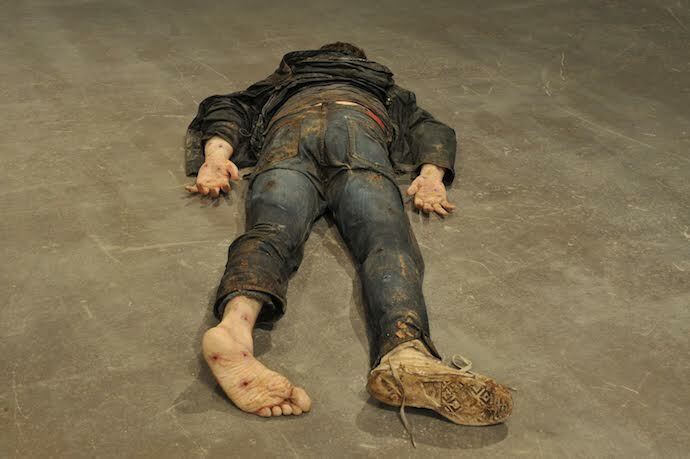 And although the positioning of the body more than suggests death—it’s the visual reeking of its state—there is nothing to the face that is more or less absent than sleep. That something so archetypal in its end still retains this perceived aptitude for waking is yet another reason for us to recognize death beyond that of some conclusive predicament, and as instead the created organ of some larger body of temporized unfinishing. If death were not inconclusive in this way we would not recognize it as death at all: what we would see in its place is the demolition of a building no one ever entered. That there are attempts at such seeing, that remain attempts for the effort expended is never fully effectuated, is spurred on by the deepest disgust at the unknowing we’ve made of our real, and a longing for some resolvable stratagem to exist for being less than human and yet so much more for having conceived the need to contrive an escape. What is the stratagem by which we can mourn ourselves forever? And shouldn’t every instant of our lives bear the marks of this mourning, thereby establishing death as both beyond us and precarious? This mythopoeia of death is what it means to enfold and comprise the reality of simulation, to at once accept that life and death have become equivalences, each lacking autonomous reality, but also to establish death outside of ourselves as a mocked-up resurrection of some agent of destruction that has nothing whatsoever to do with us. In other words, death is revived as an embodiment of nothing, just as being is nothing, but a nothing around which we trace a line for fear of never being able to tell the difference. On this account, murder is no longer the facilitator of death but rather our attempt at sacrifices in its honour. Death is the simulacrum of death, because to fall back on its supposed reality would be to nullify our necessitated allegiance to its potentiality, and it is only from this death of death that anything resembling (but only resembling) life can emerge. The real corpse is presented to us only to help obscure the fact that there are no more corpses. The only deaths that happen are the deaths we see every day, those representations of real death, the dead that may or may not actually be dead. For now we have less stake in death, dying well is just equivalent to not dying at all, and where dying itself has become synonymous with attendant excesses of pain we just replace it with sleep. [i] Primo Levi, The Drowned and the Saved (Abacus, 1989) 99. [ii] Jean Baudrillard, Simulacra and Simulation (The University of Michigan Press, 2014), 20. [iii] See Levi, The Drowned and the Saved, Ch. 5. [iv] While irreverence remains the true threat, for the difference here is one of immediacy: the instantaneous conceptual menace on the one hand and the indefinitely postponed physical menace on the other. [v] Baudrillard, Simulacra and Simulation, 24.